“Milk and Honey” is a girl who lives in a foreign country far far away. She loves milk and honey so much. She is wearing adorable one piece with apron and babushka! Her ethnic style outfit is an assemble of one-piece type dress, lace collar on blue top with sleeves plus red polka dots skirt and flower pattern apron. Her babushka that gets along well with her skirt is made of cotton lace and flower on both sides. She is also wearing pink socks and brown strap shoes. Her hair is dark brown with bangs and loose curl in the back. The hair is about her waist long. She wears olive yellow eye shadow, salmon pink cheek and pink lips for her make-up. 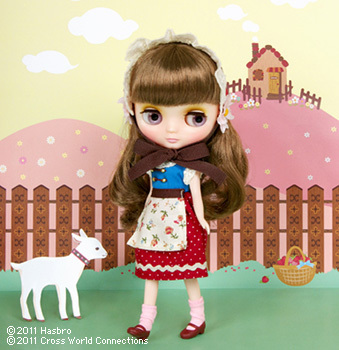 Set Detail : Doll, one-piece, head dress, socks, shoes, pants and doll stand. Melomelomew our cute Middie kitten! 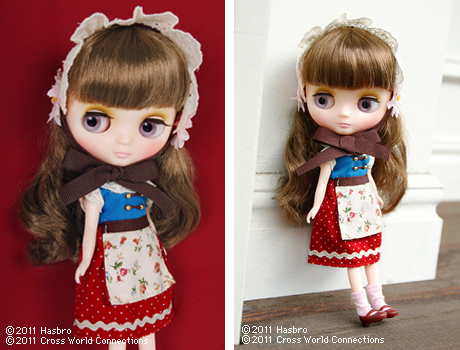 She is the first Middie Blythe to have a kigurumi animal suit. Her cute animal suit comes has a sweet and fluffy tail! The light blue and white striped apron is so perfect. 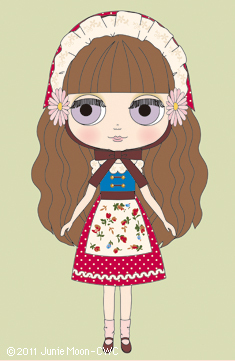 She loves cute things and dressing up pretty, which is why she has heart buttons, ribbon and lace on her sweet dress. 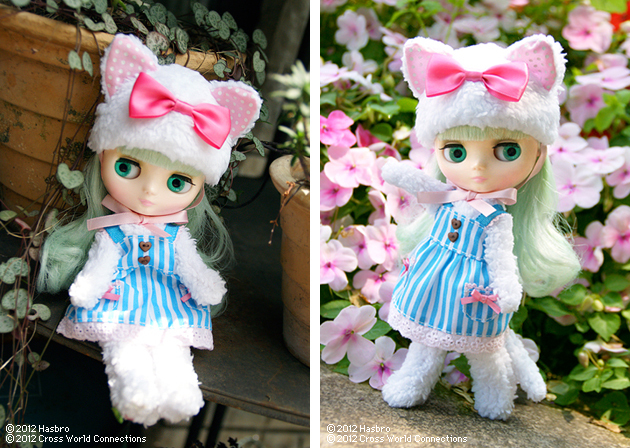 Her animal suit has adorable little cat ears complete with pink polka dot pattern inside that adds to her charming look. Her mint green hair has soft, curly waves with bangs. She even has a matching mint green doll stand. 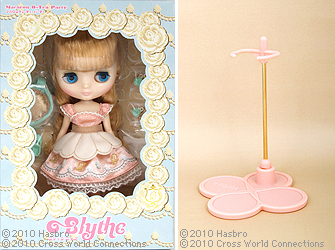 Set Contains: Doll, Animal Suit, Dress, Hat, Underwear, and doll stand. Q-pot and Blythe! 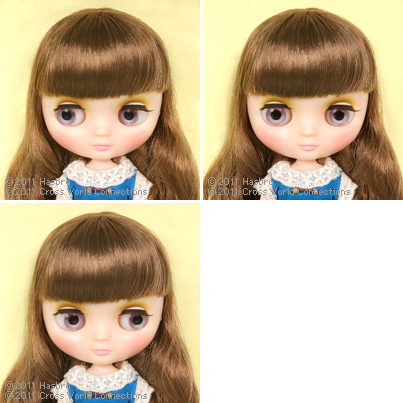 First Middie Blythe Debut! Thank you for being so patient while awaiting the final images! We are very excited to introduce you to newest collaboration between world renowned Japanese accessory brand Q-pot. and CWC! 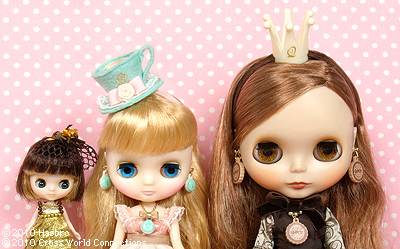 We have worked together to bring you the first ever, Middie Blythe called "Macaron Q-Tea Party." Tea time is the perfect time to retire to the garden for a relaxing escape. The intoxicating aroma of the flowers in the sunshine fill the air. The light colors of the pink tea roses resemble the color of sweet Parisian macarons. Once the treats are done baking we will be ready for our luxurious afternoon tea party, make yourself at home and enjoy this time with us! 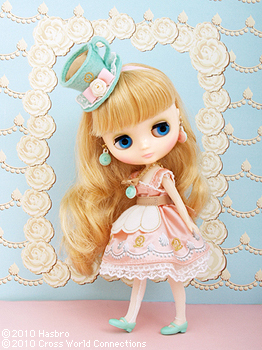 "Macaron Q-Tea Party" has a soft and welcoming look coordinated with her sweet and romantic styling. Her strawberry pink dress is embroidered with the Q-pot. brand, signature "Q" and whipped cream print. Her apron is light and airy, and brings to mind fresh whipped cream. 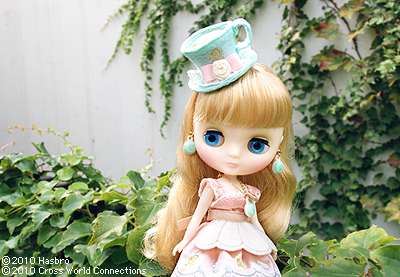 Her gorgeous little hat is a little tea cup filled with mint tea! Like any proper tea cup, it features a beautiful rose and lace motif to make it truly festive for our afternoon tea! Her necklace and earrings have the signature Q-pot.’s "Q" and are made to look like strawberry and mint green Parisian macarons, how sweet! She wears lace tights and mint green strapped shoes. Her hair is a lovely honey blond, and has a slight wave perm giving her a romantic and sweet look. She wears mint green eyeshadow and has fresh pink lips and cheeks, just right for an outdoor party. Her eyes are blue and are so inviting and warm. Her skin type is Very fair. 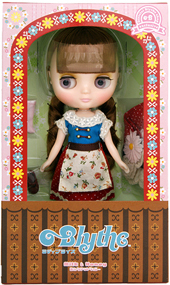 [ The set includes ] Doll, pink dress with decorative print, apron, tea cut hat, Q-pot. brand signature macaron necklace in mint, Q- pot. Brand signature macaron earrings in mint green and strawberry, tights, mint green shoes, bloomers, and new Middie Blythe stand. 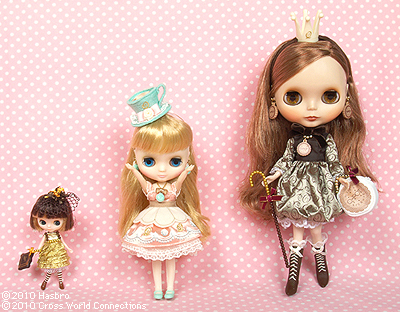 *The pictures above are to compare the body size of Neo, Middie and Petite Blythe. 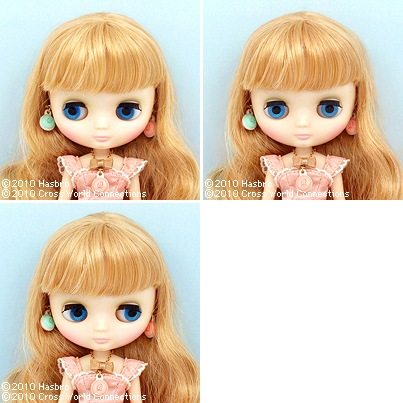 CWC Exclusive Neo Blythe "Princess Milk BisQuit de Q-pot." 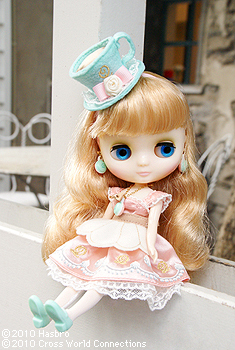 and CWC Exclusive Petite Blythe "Mademoiselle Chocolat de Q-pot." are not available for purchase now.